Customkey such a warkey etc. Make your own shortcut of all your skill in single press, you can combine all skill and even inventory. Only if you're using invoker, automaticly cast some spell then invoke it for you. You can say anything about your gameplay in single press, but do not spam it! This Only works for warcraft iii to change your default skill's shortcut into anything you want. Activate legacy of your control if you're using legacy, make it blank if you are not. This button will open your warcraft iii and works if Warcraft III toggle is checked. This checkbox will improve fps of your warcraft iii. This reconnect mean for warcraft III especially for NusaReborn PvPGN   Server, so you don't have to fear if you have bad connection. 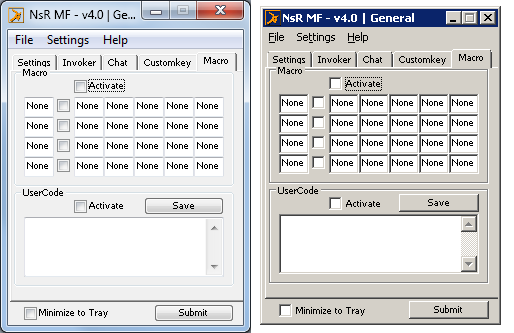 Window mode for warcraft iii, you can use it along with OpenGL, Fps,   Reconnect checked and run it with clicking Warcraft III button. If you're using window mode to play warcraft, you can set MouseBlck   checked for better playing. safe your cursor, ignore missclick. 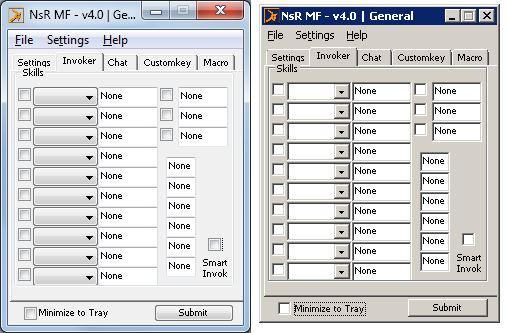 This tab all are about invoker skills, start for left checkbox for activate invoker skill. Active your chat message to your allies or both, first of all you should   activate chat system with clicking checkobx on left side, the right  one  you can use it for all players. If you want to set your chat only for allies, ignore the second   checkbox, but if you want to set your chat for all player, why not both   ?! 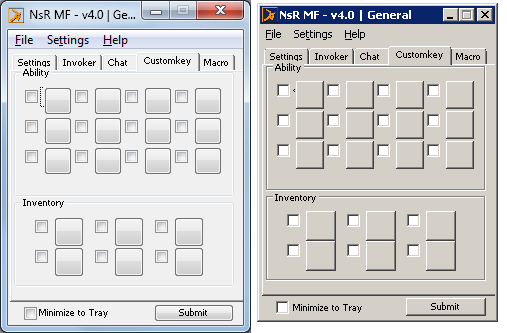 Here is the most people looking for, a customkey for warcraft, set your   own shortcut into anything you want, even Windows button, capslock,   shift, etc. just check the skill you want to change and press the   button. Position are same as warcraft iii ability area, but for   inventory its rotated 90 degree to right. Default shortcut of ability depends on hero, but all postitions are same, so you can change it with straight key or anything. 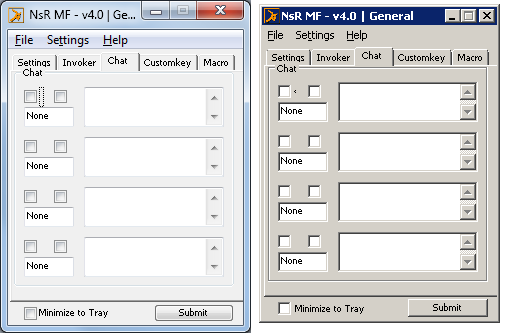 This tab will combine your skill and/or your inventory to single press and release it straight after you press a hotkey. the first Hotkey for trigger of all spell, checkbox on the right of   first hotkey for 'point target skill', if skill you want to combine is   point target check it. but if skill you want to combine is self-target   type, don't need to check it. e.g. Skill on Lina with her item Ethereal, Dagon. click Submit, when you press A (as a hotkey), your hero will automaticly   spam her skill started by Ethereal and ended by Dagon just with single   press. don't forget to check activate box if you want activate macro or usercode. On usercode, you don't need to check point target because its all code   for point-target skill. But if your skill is self-target, use Macro   without checking the checkbox. Everytime you release your ultimate, soul ring will automaticly pressed.